Queen Mary is considered by many as one of the most popular members of the British Royal Family. Her image in the memory of the Britons across generations has never been tarnished by time. Never a stranger to the dictum of the people of her kind, she endeared herself to Queen Victoria for her grace, quiet dignity and dedication to duty. Through the years, she had remained a steadfast figure despite many upheavals and challenges faced by her husband’s reign, warfare, or even personal tragedies (she survived the death three of her children). Her penchant for jewelry and her interest in collecting and in recovering items that once belonged to the Royal Family enabled her to bequeath a sizable collection that are now considered priceless treasures. Victoria Mary Augusta Louise Olga Pauline Claudine Agnes was born on May 26, 1867 at Kensington Palace in London. Her father was Prince Francis, Duke of Teck, whose father was Duke Alexander of Württemberg. Duke Alexander, however, married morganatically Countess Claudine Rhédey von Kis-Rhéde, thus, losing his right and his children’s rights to the throne of Wurttemberg. 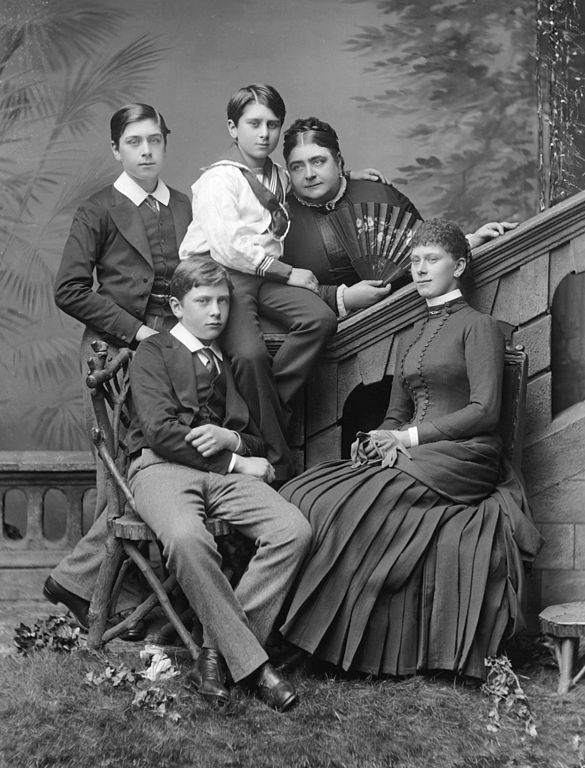 Mary’s mother was Princess Mary Adelaide of Cambridge, the third child and younger daughter of Prince Adolphus, Duke of Cambridge, and Princess Augusta of Hesse-Kassel. The Duke of Cambridge was the tenth child and seventh son of King George III. She was affectionately called May by her family and friends. As the eldest of four children and the only girl among the siblings, Mary had to learn how to “exercise her native discretion, firmness and tact" since she was often left solving the quarrels of her younger brothers. The Duke and Duchess of Teck derived their income mainly from the Duchess’ Parliamentary allowance of £5,000. The Duchess’ mother, the Duchess of Cambridge, supplemented this with an additional £4,000 a year. Despite these generous bequests, the family were often in debt, thanks to the Duchess of Teck’s lavish lifestyle. In 1883 the family had to move to Europe to economize. With this, Mary had the chance to explore the galleries, churches, and museums of Italy, where the family stayed with relations. The family returned to London in 1885, where they were allowed to take residence at White Lodge, in Richmond Park. Princess Mary’s strong character and sense of duty ingratiated her to Queen Victoria. This made her a strong candidate to become the bride of Albert Victor, Duke of Clarence, the eldest child of the future Edward VII. 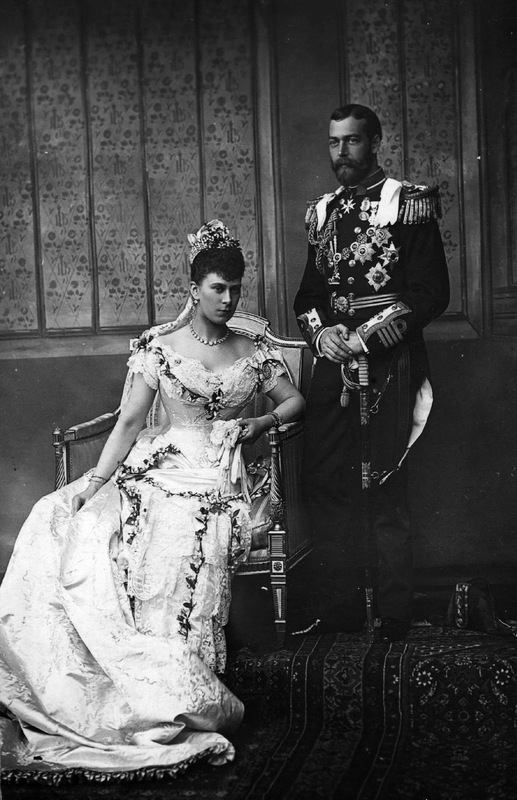 In December 1891, their engagement was announced but Albert died of flu in 1892. She was eventually engaged to the Duke of Clarence’s younger brother, Prince George, Duke of York, who became second in line to the throne. The match was eventually a successful one and the couple became deeply in love with each other. They were married on July 6, 1893 at the Chapel Royal, St. James’s Palace. The couple took the apartments at St. James’s Palace as their London Home but their favorite home was York House in the Sandringham estate. The wedding portrait of the Duke and Duchess of York. Mary carried her strong sense of duty as Duchess of York and, later, as Princess of Wales. She busied herself with a variety of public duties, often joining her husband in various trips abroad in support of the King Edward VII. Despite her serious public image and inscrutable private life, Mary was considered a caring mother, although she was considered emotionally distant from her children. She actually showed her fun-loving and frivolous side to her children and she even taught them history and music. The death ofher youngest son, Prince John, in 1919, left her in an utter state of shock. "Our poor darling little Johnnie had passed away suddenly ... The first break in the family circle is hard to bear but people have been so kind & sympathetic & this has helped us [the King and me] much,” she wrote in her diary. Princess Mary, Duchess of York and Wales, 1901. 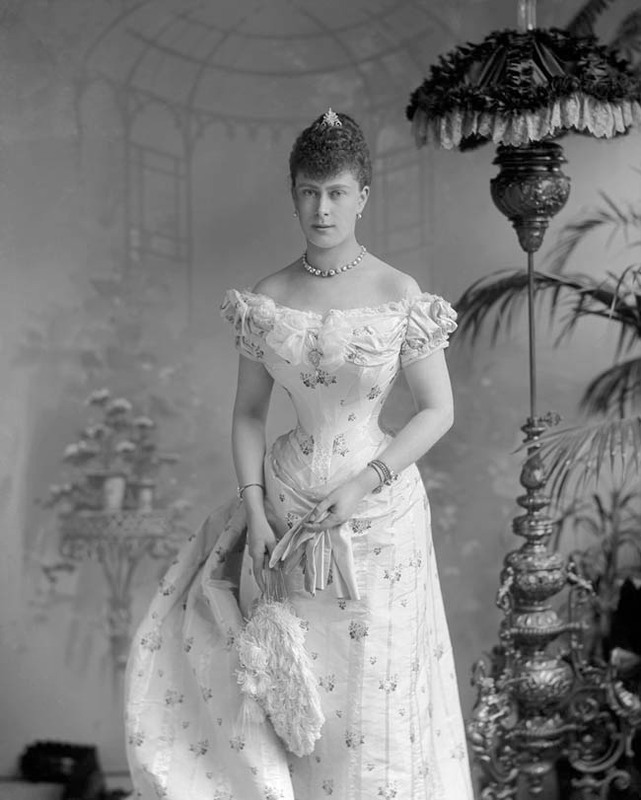 Upon the death of King Edward VII, her husband succeeded as George V and she became Queen Consort. They were crowned at Westminster Abbey on June 29, 1911, highlighting the royal splendor that no other royal houses could surpass. They travelled to India where they were crowned Emperor and Empress of India at the Delhi Durbar on December 12 before they toured the subcontinent. Queen Mary showed her interest on issues that concerned the welfare of women and children. At the onset of World War I, she organized Queen Mary’s Work for Women Fund to provide employment to as many women as possible who were displaced by the armed conflict. More than 70 special relief workrooms were opened that gave these women work. She also inaugurated Queen Mary’s Needlework Guild to provide clothing for those affected by the War. After World War I, Queen Mary continued to rally behind her husband’s support. She served as his adviser on speeches, history and royalty and on issues affecting his position. The King, in return, highly esteemed Queen Mary for her, intelligence and judgement. Despite the major political changes and civil unrest that shook the 1920s, the Queen remained calm throughout all her public engagements. She also spent more time caring for King George V, whose health started to decline in the late 1920s, a fact acknowledged by His Majesty when, after he survived his illness in 1928, Sir Farquhar Buzzard, the King’s physician, asked him who had saved his life. He replied, "The Queen". 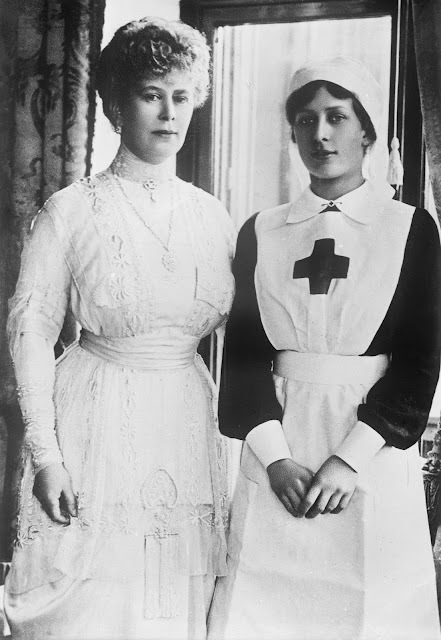 Queen with her daughter Mary during the First World War. A fitting opportunity to pay tribute to their Majesties for their dedication to their duty and to the nation came in 1935, when they celebrated their silver jubilee on the throne. The entire empire celebrated this milestone. In his speech, King George V paid tribute to his wife, having told his speechwriter, "Put that paragraph at the very end. I cannot trust myself to speak of the Queen when I think of all I owe her." The King died on January 20 the following year and as Queen Mother, Mary had to brave the constitutional crisis brought about by Edward VIII’s abdication to marry the woman he loved, the two-time divorcee Wallis Simpson. She threw her support to her second son, the reserved and stuttering Prince Albert, Duke of York, who succeeded as George VI after Edward’s abdication in December 1936. Queen Mary broke tradition when she attended the coronation of his son in 1937, the first British dowager queen to do so. Despite Edward's abdication, Queen Mary still loved her son but her disapproval of his action never dithered. 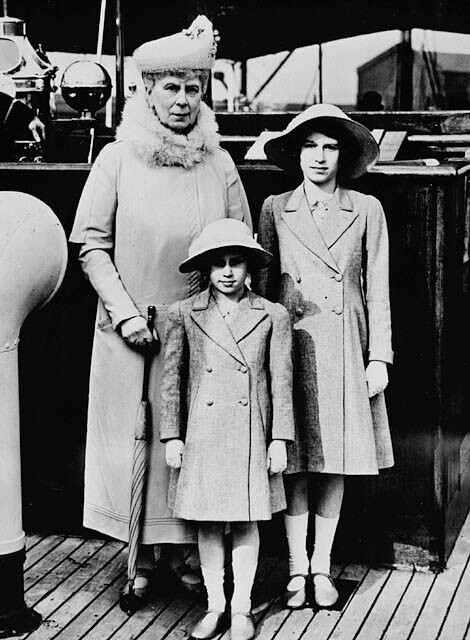 Queen Mary took a special interest in in the education of her granddaughters, Princesses Elizabeth and Margaret, taking them to visits in art galleries and museums in London. When World War II erupted, Queen Mary moved to the countryside and took up residence at Badminton House in Gloucestershire, with her niece, Mary Somerset, Duchess of Beaufort. She visited troops and factories nearby to boost the morale of the soldiers. She also directed the gathering of scrap materials and even gave soldiers a ride whenever she spotted them on the roads. In 1942, Queen endured another blow after her youngest surviving son, Prince George, Duke of Kent, died in an crash while on active service. Ten years later, in February 1952, King George VI died. 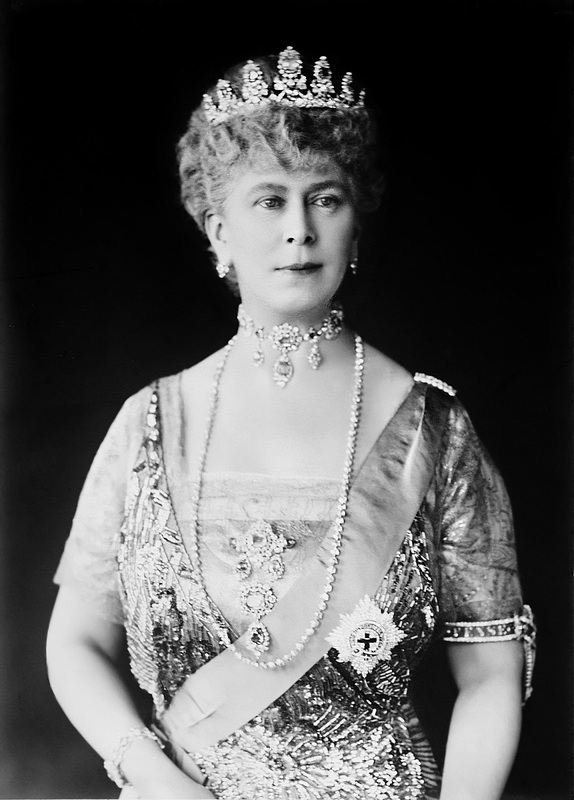 “I got a dreadful shock when Cynthia [Colville] asked to see me at 9.30, after breakfast, to tell me that darling Bertie had died in his sleep early today,” said Queen Mary. She passed away the following year on March 24, 1953 due to lung cancer (although it was announced that time that the cause of her death was "gastric problems"). It was her wish that the coronation of Queen Elizabeth II should carry on as planned. Queen Mary was an avid collection of anything connected the Royal Family. 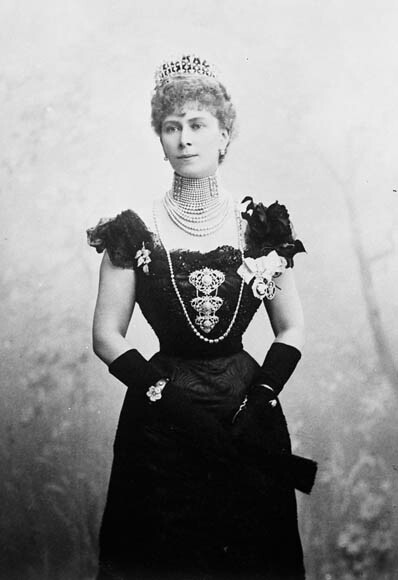 In fact, she spent huge sums of money acquiring the jewels from the estate of Dowager Empress Marie of Russia and paid three times the market value of the Cambridge Emeralds from Lady Kilmorey, who was the mistress of her late brother Prince Francis. For being "above politics ... magnificent, humorous, worldly, in fact nearly sublime, though cold and hard,” Sir Henry “Chips” Channon called Queen Mary “a grand Queen." During her lifetime and beyond, she was immortalized by dedicating and naming ships, hospitals, colleges, and even a mountain in her honor. Actresses also portrayed her on film and TV, but none could ever surpass the one-woman act that is Queen Mary. Wasn't this the woman the one who when she admired someone's jewelry expected them to take it off and give it to her? Or has someone been telling tales?